The liturgy celebrates today the mercy of God towards us, poor sinners. (Collect, Postcommunion) Jesus has come not to call the just but sinners, and the Holy Ghost comes to establish the reign of God in our sinful, unclean hearts. The Sanctifier continues in our hearts the action of Christ, coming to establish the reign of God in sinful souls. He therefore proclaims by the mouth of Peter, the Head of the Church, our weakness before the devil, who, like roaring lion, seeks to devour us (Epistle). The human race has fallen into sin. 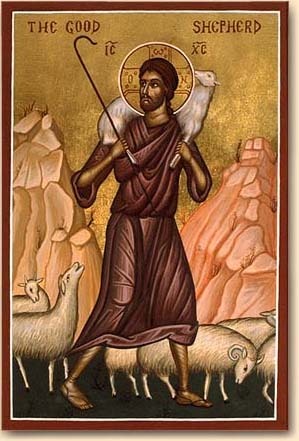 It is represented by the lost sheep which the divine Shepherd bore on His shoulders, and by the lost drachma struck with the effigy of the King of Heaven and which the Church found again (Gospel). Look toward me, and have pity on me, O Lord, for I am alone and afflicted. Put an end to my affliction and my suffering, and take away all my sins, O my God. Ps 24:1-2 To You, I lift up my soul, O Lord. In You, O my God, I trust; let me not be put to shame. V. Glory be to the Father, and to the Son, and to the Holy Ghost. R. As it was in the beginning, is now, and ever shall be, world without end. Amen. Look toward me, and have pity on me, O Lord, for I am alone and afflicted. Put an end to my affliction and my suffering, and take away all my sins, O my God. O God, protector of all who hope in You, without Whom nothing is strong, nothing is holy, increase Your mercy toward us, that, with Your guidance and direction we may so pass through the things of this temporal life as not to lose those of life eternal. Through Jesus Christ, thy Son our Lord, Who liveth and reigneth with thee, in the unity of the Holy Ghost, ever one God, world without end. R. Amen. Let us pray. Graciously hear, O Lord, the prayers of Thy Church that, having overcome all adversity and every error, she may serve Thee in security and freedom. Through our Lord Jesus Christ, Thy Son, Who liveth and reigneth with Thee in the unity of the Holy Ghost, God, Forever and ever. R. Amen. Lesson from the first letter of St Peter the Apostle. Beloved: Humble yourselves under the mighty hand of God, that He may exalt you in the time of visitation; cast all your anxiety upon Him, because He cares for you. Be sober, be watchful! For your adversary the devil, as a roaring lion, goes about seeking someone to devour. Resist him, steadfast in the faith, knowing that the same suffering befalls your brethren all over the world. But the God of all grace, Who has called us unto His eternal glory in Christ Jesus, will Himself, after we have suffered a little while, perfect, strengthen and establish us. To Him is the glory and the dominion forever and ever. Amen. GRADUAL/ALLELUIA Psalm 54:23, 17, 19. Cast your care upon the Lord, and He will support you. V. When I called upon the Lord, He heard my voice from those who war against me. Alleluia, alleluia. V. Ps. 7:12. A just judge is God, strong and patient; is He angry every day? Alleluia. At that time, the publicans and sinners were drawing near to Him to listen to Him. And the Pharisees and the Scribes murmured, saying, This man welcomes sinners and eats with them. But He spoke to them this parable, saying, What man of you having a hundred sheep, and losing one of them, does not leave the ninety-nine in the desert, and go after that which is lost, until he finds it? And when he has found it, he lays it upon his shoulders rejoicing. And on coming home he calls together his friends and neighbors, saying to them, ‘Rejoice with me, because I have found my sheep that was lost.’ I say to you that, even so, there will be joy in heaven over one sinner who repents, more then over ninety-nine just who have no need of repentance. Or what woman, having ten drachmas, if she loses one drachma, does not light a lamp and sweep the house and search carefully until she finds it? And when she has found it, she calls together her friends and neighbors, saying, ‘Rejoice with me, for I have found the drachma that I had lost.’ Even so, I say to you, there will be joy among the angels of God over one sinner who repents. They trust in You who cherish Your name, O Lord, for You forsake not those who seek You. Sing praise to the Lord enthroned in Sion, for He has not forgotten the cry of the afflicted. Look with mercy, we beseech You, O Lord, upon our act of worship that the gift we offer may be acceptable to You and may support us in our frailty. Through Jesus Christ, thy Son our Lord, Who liveth and reigneth with thee, in the unity of the Holy Ghost, ever one God, world without end. R. Amen. Protect us, O Lord, who assist at Thy mysteries, that, cleaving to things divine, we may serve Thee both in body and in mind. Through our Lord Jesus Christ, Thy Son, Who liveth and reigneth with Thee in the unity of the Holy Ghost, God, Forever and ever. R. Amen. I say to you: there is joy among the angels of God over one sinner who repents. May the holy things of which we have partaken bring us to life and prepare for Your everlasting mercy those whom You have cleansed from sin. Through Jesus Christ, thy Son our Lord, Who liveth and reigneth with thee, in the unity of the Holy Ghost, ever one God, world without end. R. Amen. Let us pray. May the gift of this Divine Sacrament which we have offered, cleanse and defend us, we beseech Thee, O Lord; and through the intercession of the Blessed Virgin Mary, mother of God, of St. Joseph, of Thy holy apostles Peter and Paul, and of all the saints, free us from all iniquity and deliver us from all adversity. Let us pray. O Lord our God, we pray Thee that Thou suffer not to succumb to human hazards those whom Thou hast been pleased to make sharers of divine mysteries. Through the same Lord Jesus Christ, Thy Son, Who liveth and reigneth with Thee in the unity of the Holy Ghost, one God Forever and ever.